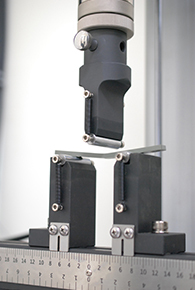 Tensile testing is performed by elongating a specimen and measuring the load carried by the specimen. From a knowledge of the specimen dimensions, the load and deflection data can be translated into a stress-strain curve. A variety of tensile properties can be extracted from the stress-strain curve. 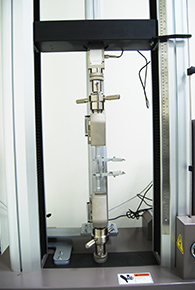 Tensile tests measure the force required to break a plastic sample specimen and the extent to which the specimen stretches or elongates to that breaking point. Specimen is pulled from both top and bottom, the force required to pull the specimen apart is determined, along with how much the material stretches before breaking. Its tensile strength is therefore the ratio of stress to strain below the proportional limit of the material. Breaks apart when deformed, this determines its maximum tensile strength. Exhibit both viscous and elastic characteristics when undergoing deformation. It also exhibits time dependent strain. 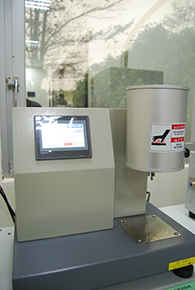 IZOD is one of the most important machines used to determine the impact resistance of materials, especially plastic. The Izod impact test fixes one end of a notched specimen in a cantilever position by means of a vice. A striker on the arm of a pendulum or similar energy carrier strikes the specimen. The energy absorbed by the specimen in the breaking process is known as the breaking energy. 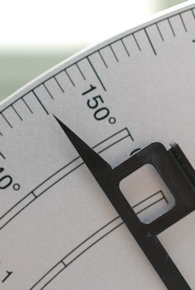 If the impact set at a 90-degree angle, data collected from the notch would be considered. If the impact is flat, data collected not from a notch would be considered. Greater data corresponds to greater impact resistance. Melt flow rate is a measure of the ease of flow of the melt of a thermoplastic polymer. Originally the term is called [Melt Flow Index] or [Melt Indext (MI)] (Usually used for PE, but can also be used for various other materials). Standard rate flow is measured g/10min [MFR]. Another unit used for melt flow is cm3/10min [Melt volume rate (MVR)]. MVR times the density of the aqueous solution is MFR. Specific gravity is the ratio of the density of a substance to the density (mass of the same unit volume) of a reference substance. Apparent specific gravity is the ratio of the weight of a volume of the substance to the weight of an equal volume of the reference substance. The reference substance is nearly always water for liquids or air or gases. 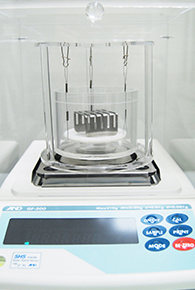 Temperature and pressure must be specified for both the sample and the reference. Pressure is nearly always 1 atm equal to 101.325 kPa. Materials with specific gravity value over 1 sinks under water, vice versa, values lower than 1 floats on top of water. It is easy to confuse specific gravity with density. However, density is mass over volume, specific gravity, on the other hand, is the comparison between two densities. Therefore, it is easier to use specific gravity to determine whether a material or object will float on top of water. Flexural strength is a measurement that indicates a material’s resistance to deforming when it is placed under a load. 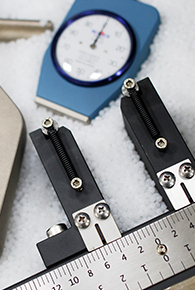 The values needed to calculate flexural strength are measured experimentation, with rectangular samples of the material placed under load in a 3 or 4 point testing setup. The following is an equation for flexural strength: Flexural strength(Mpa)=3PL/2Wh2 P=maximum resistance, L=distance between the two outer supports (mm), w and h are the width and height of the beam. Flexural modulus is the ratio of stress to strain in flexural deformation, or the tendency for a material to bend. It is determined from the slope of a stress-strain curve produced by a flexural test, and uses units of force per area. The 3 point testing equation is the following: (Mpa)=L3/(4Wh3)x(F/Y) L is the distance between the two outer supports, w and h are the width and height of the beam. Y is the deflection due to the load F applied at the middle of the beam.